Nitrogen Cylinder also Known as Nitrous Oxide Cylinder. Nitrous Oxide Cylinders are available with pressured reducing valve and safety valves that assures their reliability. These cylinders are produced for storage and delivery of Nitrous Oxide medical gases which used in hospitals and medical establishments. These Nitrous Oxide cylinders are ultra clean from inside having smooth internal surface to avoid any contamination and minimizing the risk of consequent valve blockage. Nitrous Oxide cylinders are ideal for maintaining the purity and quality of gas being dispensed. Special care is taken to produce these cylinders and these are available in various water capacities for portable and fixed applications. 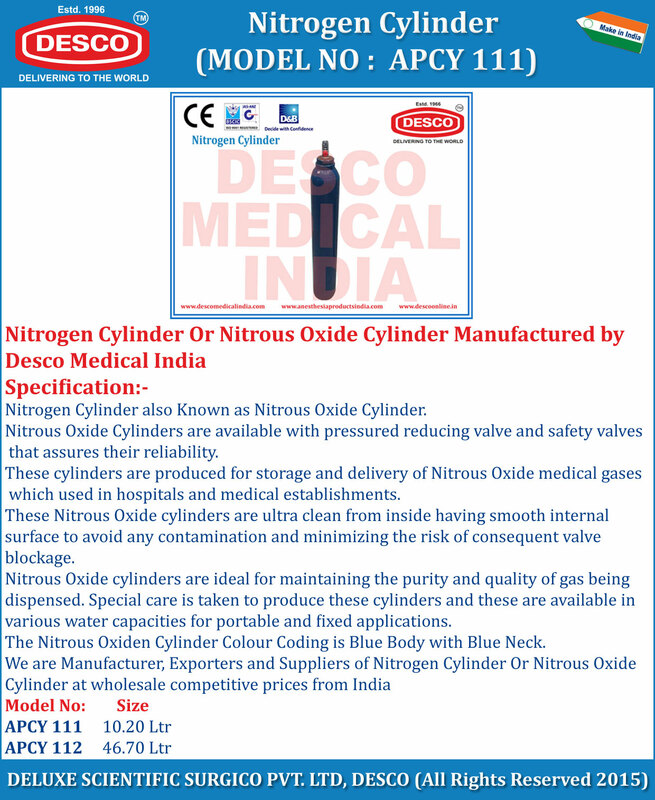 The Nitrous Oxiden Cylinder Colour Coding is Blue Body with Blue Neck. We are Manufacturer, Exporters and Suppliers of Nitrogen Cylinder Or Nitrous Oxide Cylinder at wholesale competitive prices from India.